The Honors String Quartet is open to students in the YOBC Symphony Orchestra. Students must audition and commit to the required performances. Coached by Colin Oettle, the quartet features four of our most talented string musicians in a challenging musical environment. Honors String Quartet students receive a scholarship for their participation. 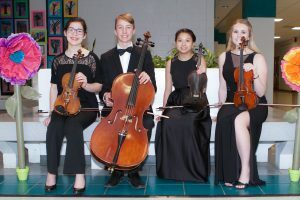 Part of the commitment to the Honors String Quartet includes performing at a minimum of three community events to be determined by YOBC (taking students’ schedules into consideration). The group will also perform prelude music for YOBC’s Fall and Spring Concerts, and in February at the YOBC Chamber Ensemble Recital.